Control the entire site from a single interface. From style & design, to code, and management, you can configure your eDirectory with complete ease. You can add, edit, update, and remove every aspect of your directory site. The site manager brings together a ton of features to make directory management a piece of cake. If you have more than one eDirectory, you can manage them all from within a single interface, we call it our multi-site manager. No complications, just simplicity by design - nice and easy. Control every SEO aspect of your site: titles, meta, and even your keywords. You can set rules for pages or update an individual page with the specific text you want to target. 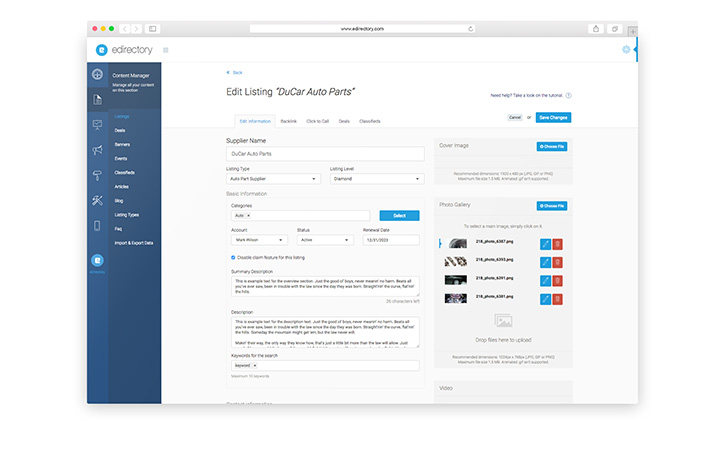 See how your eDirectory is performing with our incoming payment feature, invoicing, and a complete history of revenue records across your site. See everything in a easy-to-use interface in order to make decisions with the right data. Add everything into a moderation funnel, whether it be users posting reviews, sponsors adding advertising, or listing owners signing up, you approve all content before it goes live. This way your site remains streamlined. As administrators, listing owners, site users, and sponsors, you can configure user roles for your site, specifically which users have which access to which functions. If you have a lot of data on your site, no problem. You can search everything across your site in seconds. If you're looking for a specific piece of data, tap in the search box, and your results will be easily yielded. Control your directory location data from countries all the way down to individual neighborhoods. There's no limit on the detail of your location data. If you're bringing a lot of data with you, use our import tool to seamlessly add your existing data to your new eDirectory installation - a few clicks and everything will be there. Configure and build your mobile apps right through the admin interface. After the build is complete, you can download the builds and submit them to your own Apple App Store and Google Play Store Accounts.